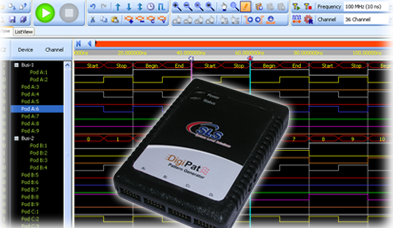 A PC based pattern generator, SPG2100 DigiPat, featured with 36 channels, 100 MHz, is designed for testing, debugging and characterizing any digital hardware by generating a variety of digital signals. The DigiPat hardware comes with the software that communicates via USB interface and has an intuitive and user friendly GUI for quickly editing/designing and generating digital patterns. The DigiPat software supports windows. This allows for more organized waveform edit options (with color coded data and increased screen size), intuitive user interface, and data management (file saving, loading, printing).